Leak Detection Associates manufactures high sensitivity leak detection systems for the pharmaceutical, medical device, & food industries. Leak Detection Associates is considered the world leader in pharmaceutical leak detection, as well as other industries, with our strong technical background in helium leak detection. Using helium leak detectors (helium as the tracer gas), packages can be quantitatively tested to levels far exceeding vacuum bubble or dye penetration tests. We have been in the business of developing, manufacturing and installing integrated helium leak detection systems for more than twenty five years. Leak Detection Associates manufactures high sensitivity leak detection systems for the pharmaceutical, medical device and food industries. We have just launched a new version called the SIMS 1284+, which combines the latest in helium leak detection technology along with our SIMS software for data collection and analysis. Using helium as a tracer gas, packages can be quantitatively tested to levels far exceeding vacuum bubble/dye penetration tests and pressure/vacuum decay methods. Quantitative leak data allows direct comparison across various packaging materials/forms, production line settings, and stability storage conditions. The technology and equipment can be used for package design, tooling qualification, production line setup and on-going product quality monitoring. Our systems are ideally suited for packages (cold form aluminum blistercards, foil pouches, parenteral vials, or syringes) requiring a higher level of seal integrity to provide gas permeation or microbial ingress protection/security. We offer different versions of the basic pharmaceutical (foods & medical device) Seal Integrity Monitoring System Unit, as well as technical support, testing services and R&D programs. Helium leak detection technology is used to confirm the presence or absence of channels and/or holes in packages; in effect, provides verification of package integrity. The detection of these defects involves the use of a light tracer gas which is capable of locating even the smallest leak quickly. The turnkey SIMS 1282+ & 1284+ unit, offered by LDA, Inc., measures the helium flow rate escaping from the test package through any and all leaks that are present thanks to a calibrated helium-specific mass spectrometer. The rate at which helium escapes from a package can be closely correlated to the rate at which water vapor, oxygen or other gasses may enter or escape from a package. Packages are filled with helium on-line, or off-line, and then placed in a Vacuum Test Fixture Module to measure the rate at which helium escapes from the package. A Head-Space Analysis Module is then used to measure the concentration of helium in the package, and provide an Actual Helium Leak Rate. The technology and equipment can be used for package design, failure analysis, tooling qualification, line setup and validation, and product quality monitoring. LDA also provides package testing and consulting services. Pharmaceutical, contract packaging, and medical device companies in thirteen countries around the world are presently employing our testing machines and utilizing our technical support and testing services. 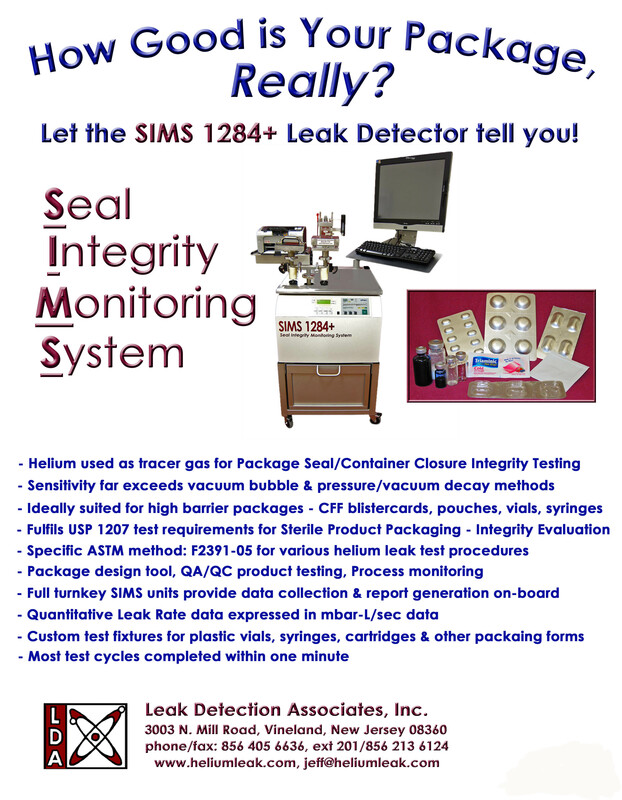 The SIMS 1282+ & 1284+ Helium Leak Detector is ideally suited for a wide variety of packages (cold form blisters, foil pouches, parenteral vials, etc.) requiring a higher level of seal integrity to provide gas permeation or microbial ingress protection and security. It is also a reliable means of ensuring properly sealed packages at the onset of stability packaging runs. Quality verification of stability test packages have saved some of our customers thousands of dollars by not having to re-start stability studies due to poorly sealed packages. We offer different versions of the basic pharmaceutical SIMS Unit which are available for rental and purchase, as well as technical support and R+D programs. While there are common elements to each SIMS Unit, there are also product-specific custom elements that are designed to meet the needs of a given client. In Plant (onsite) equipment rental available, including technical assistance on a project or contract basis. Laboratory testing services available on a project or contract basis. Staff with over 70 years combined experience in packaging development, design and testing. Helium is a non-flammable, colorless, odorless gas. Its concentration in the atmosphere is 5-50 ppm. Its small molecular size and ease of quantitative detectability make it an ideal medium for leak detection. Why use a helium leak detector? Helium leak detection offers unparalleled sensitivity for finding leaks. It is quantitative, giving an accurate measurement of the rate of a leak, as opposed to the pass/fail results obtained with a dye penetration or vacuum bubble test. Helium leak testers offer a sensitivity of 1 x 10-10cc/s. Helium leak testers cover the sensitivity ranges of other methods and up to a million times beyond. Who uses helium leak detectors? Our clients include pharmaceutical companies such as Merck, Pfizer, Schering-Plough, Johnson & Johnson, and Novartis. These systems are completely self-contained and we offer on-site validation packages for both the hardware and software. It offers the most sensitive means of determining seal quality and seal integrity. No other test device can match the sensitivity of the helium method.